In this article, we'll show you how to share your listing so applicants can apply. You'll also learn what a listing and application look like in Cozy. Potential renters can apply to your rental once you create and activate your Cozy listing. Cozy doesn't have a searchable directory of listings, but once your listing is active, we'll help advertise it by creating ads on our partner sites Realtor.com and Doorsteps.com for free. Add your contact details to your listing so renters can ask questions or arrange a showing before they submit an application. 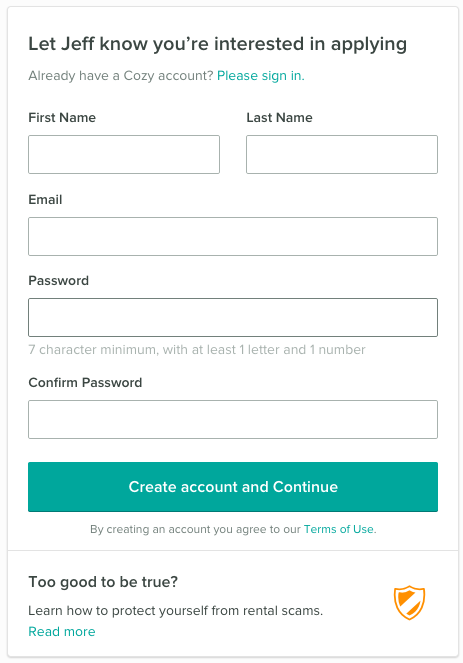 Renters can also fill out the contact form on our partner sites, which will send you their message in an email. You can also use your Cozy apply link to share your listing on other sites, social media, or directly with potential applicants. Renters can fill out an application from their computer or mobile device. They'll create a Cozy account to enter their application details and pay for their screening reports if you've required them. We'll walk them through the whole process. Whenever someone applies to your property, we'll send you an email notification. You can then login to your Cozy account and review the application as well as any shared screening reports. See what a full application looks like here. How can applicants run their screening reports?